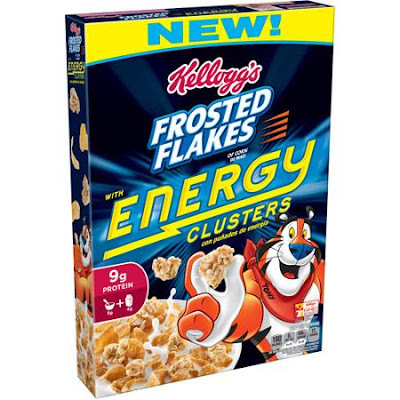 Thanks to RD and friend Andy Bellatti for highlighting Kellogg's new, "Frosted Flakes with Energy Clusters" cereal. According to Andy, it's Kellogg's most sugary cereal! No doubt the "energy clusters" name will sell far more product than would, Frosted Flakes with "Sugar Clusters", but given the cereal, at more than 4 teaspoons of added sugar per cup, contains more of the stuff cup per cup than Froot Loops and regular Frosted Flakes, no doubt it'd have been a far more honest descriptor. Consider this further proof that the word "energy", is used by the food industry, as a health-washed euphemism for "sugar".